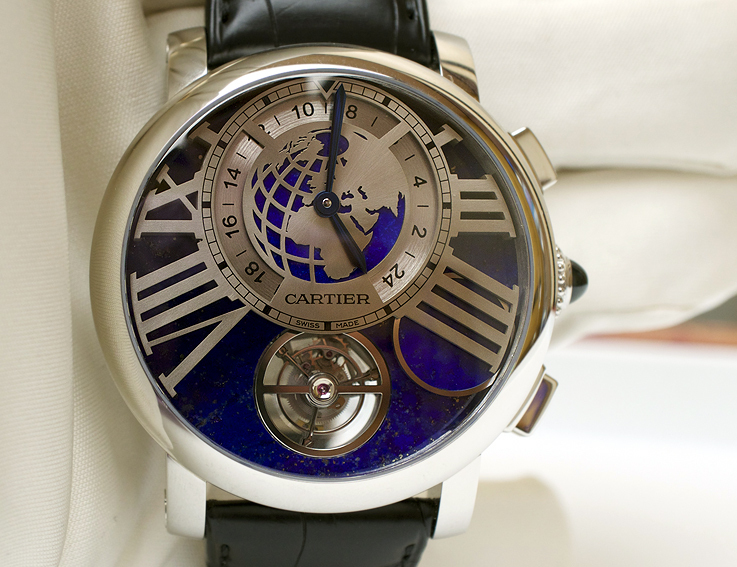 The Rotonde Earth and Moon is a tourbillon, with second timezone and moon phase indicator. 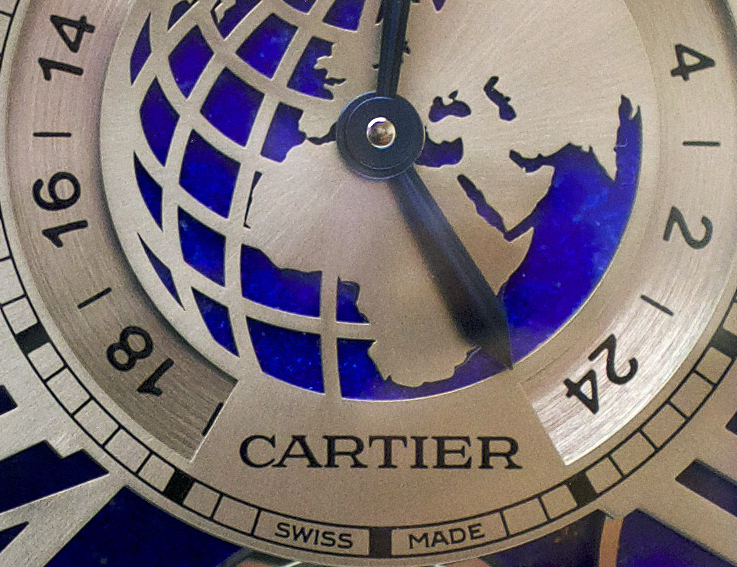 The hands of the watch are placed off centre, surrounded by a skeletonized globe and the second time zone scale. The time of the 24 hour second time zone, can be set by pushing the button at 2 o’clock and instead of moving a hand, the whole scale turns around and is set to the desired time, indicated by a little triangle @ 12 o’clock. I find this a very nice, good looking and practical solution for a second time zone indication. 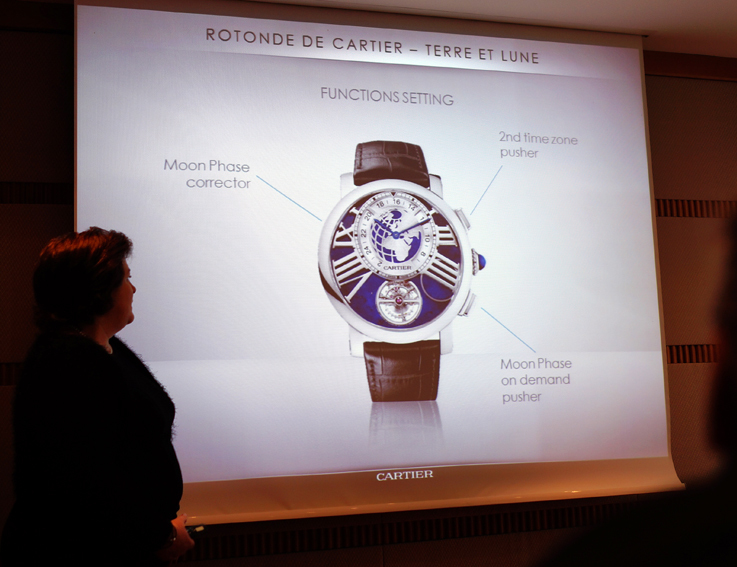 The concept of the watch comes from Carole Forestier-Kasapi, head of movement design at Cartier, while the mechanical 9940MC caliber was developed by Renaud & Papi, resulting in a caliber delivering three days of power reserve and a moonphase so accurate, that it only has a deviation a day, every 126 years. 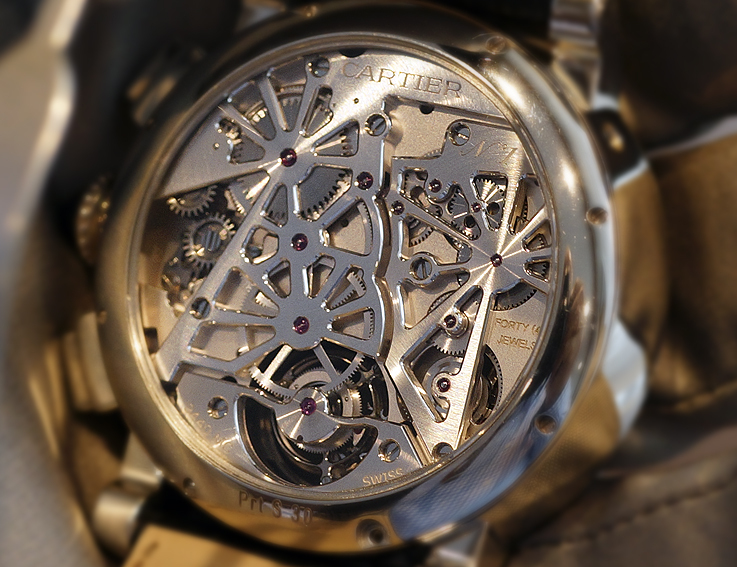 The exceptional finishes of this caliber are all the more remarkable, because the semi-skeletonised bridges on the back of the movement, are structured in a star shape, echoing this precious timepiece’s lunar and terrestrial character on the case back. When it comes to the moon phase indicator, it really gets you going. At first view there is no moon phase in sight. But then, by pushing the button @ 4 o’clock, a blue disc comes from underneath the dial, covering part of the tourbillon and becomes a share of the shadow. The now remaining and visible portion of the tourbillon, displays the exact moon phase. 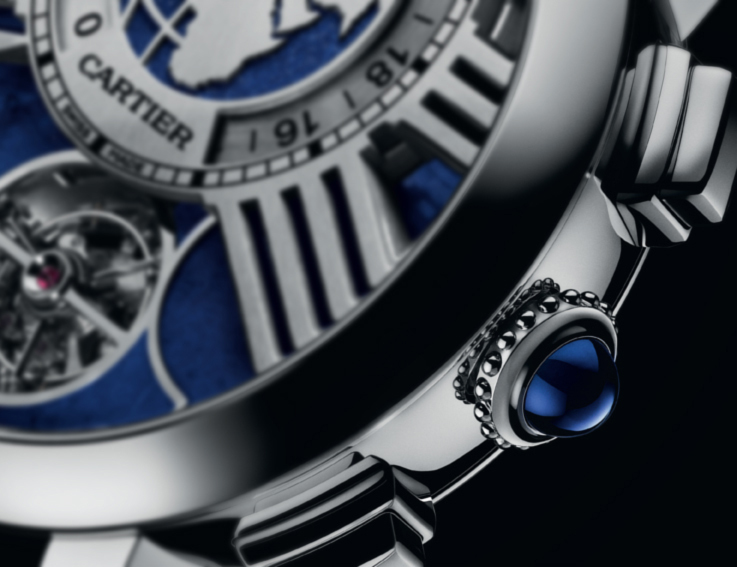 Eye catching blue is the overall colour of the dial that is visible underneath the cut out numerals and the globe. The dial is in fact Lapis Lazulli. 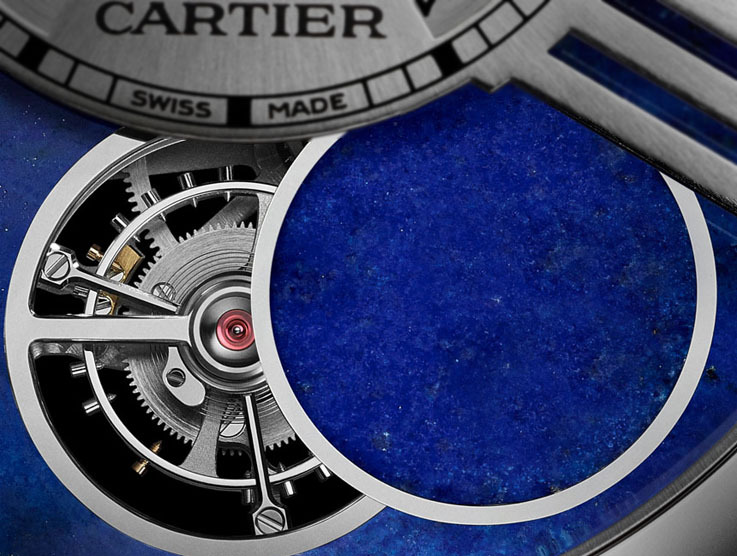 The semi precious gem stone Lapis Lazulli belonged already to the materials Cartier used in 1927, for their clocks and later on, also for watch dials. But these were always very limited productions like a ladies Panthere watch and a 38mm Pasha in white gold, with a Lapis Lazulli dial underneath a grid. 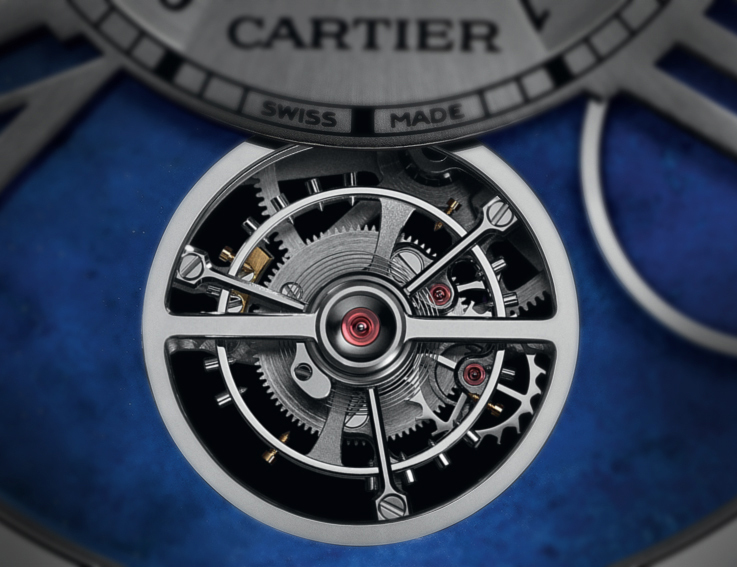 Technique and the creativity make this watch one of the exceptional pieces in the Cartier collection and beyond, whilst design and execution this watch turn into a very desirable and hard to resist timepiece. However the choice of platinum for the 47mm case, makes it also a watch that’s very present on the wrist, but for anyone interested in high watch making, this is one of those collectors watches, that are seldom presented.